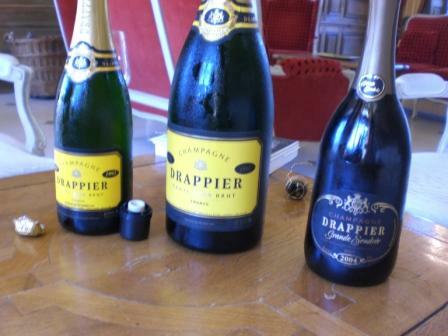 Visiting Champagne Drappier was one of those wine moments that I will remember for a long time. Not only is Michel Drappier a wonderful host, his knowledge of Champagne and the region is quite unique. Every time I spend time with Michel, he seems to somehow subtly remind me of all the facets to the wines of this family house that I have stored away in my memory neatly but not recalled recently. The incredible thing is you discover these without realising that he is opening the mystery of Drappier to you. We started our early morning visit in the drawing room near the entrance. We chatted with Michel about all things wine, Glengarry, Drappier and the Champagne region in general. Michel sits on a Champagne council and that afternoon had a big meeting with the growers regarding pricing for the 2011 vintage. His phone rang off the hook, it seemed most of the meeting and discussions were going to happen before the afternoon meeting. The region of Champagne is quite fascinating, about 250 years ago there were 55,000 hectares of vineyards that made up the appellation of Champagne, in 1945, there was a mere 5,000 and now there are 33,000. The talk of course, is of the recent decisions to increase the champagne appellation, there’s going to be land added and even some taken away. Michel explained that it’ll take years; 7 – 10 or so to see any change. The ‘new land’ has to be somehow proven as suitable to be part of the appellation, this could be because records can be found to show 250 years ago that it did have vines on it and was part of the appellation, it could also be that the land never had grapes but the makeup of the soil, the aspect, the terroir of the potential vineyard site indicates that it should be part of the Champagne appellation. In increasing the size of the appellation, the authority is not just adding land to it, but reviewing it, so there’s a chance (it’s already known for some sites) that some vineyards may be removed from the Champagne appellation, now when you consider its about 800,000 Euro per ha for vineyard land and without the vines about 25,000 per ha, there’s a little at stake – including off course the grapes each year that would come of the site. It was an interesting discussion, which from this topic went to champagne pricing globally, changes in personal in Champagne and in the end left us quite thirsty. Time to head down the stairs to the cellars. There are many things that make this Champagne house stand alone. Drappier uses very little sulphur, the lowest of any Champagne house, Michel and his father are both allergic to it, the use of sulphur is off course required for the winemaking process, there are various techniques that can assist in reducing the amount. Alongside that, sulphur is often used to clean barrels or tanks, Drappier don’t use sulphur in this way at all. 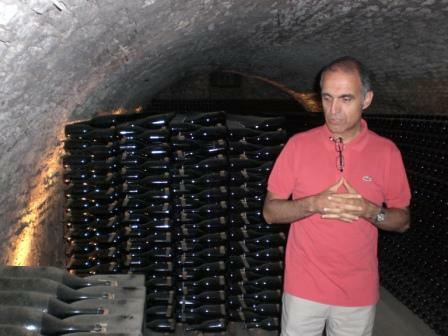 Their winemaking is very natural, organic and careful. Down in the cellars we saw the various large formats that Drappier produce. They make the biggest range of large format bottles in Champagne. The largest is a Melchizedek, the story of this bottle goes a little like this – Michel had a good customer, a surgeon, each year for his birthday he would order a large bottle for his party. As the parties went on the bottle sizes increased and eventually the largest Michel made was just not enough, so the Doctor rang and said could you make a bigger one – Michel obliged and produced this 30 litre bottle – holding 40 bottles. Michel explains – this is now big enough – oh and the doctor aged 89 has now passed away. The production of these large bottles is very special to Drappier. 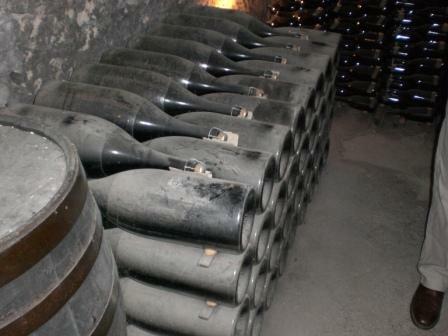 At other Champagne houses, the second fermentation is done in bottle for 1.5 litre and 3.0 litres, larger than this, the bottles are filled from smaller bottles as required. Drappier do the second fermentation in the bottle for all sizes. This is very dangerous as they have a tendency to explode – they lose 20% of the production of large bottles – that’s a lot of Champagne. 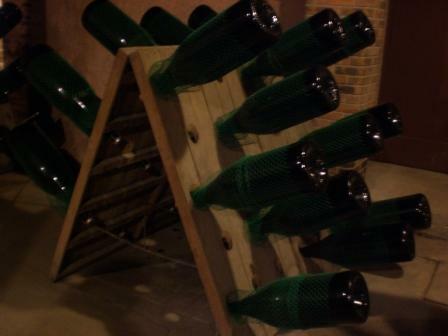 There’s a wire netting around each of the large bottles in the riddling racks, as if they do explode the glass flying could be very dangerous. So at 20% wastage, the large bottle glass is very expensive and Michel still produces them, he knows it’s crazy, but says it’s ‘still a lot of fun – so why not’. When you taste Drappier, the finish is lovely and clean, the fruit weight hides the dry nature of the Champagne, the allowed level of dosage (the sugar added at disgorgement to the wine before the cork is added) is 12gm/l, most of the big houses have a dosage around 11gm/l. At Drappier it’s now 7gm/l; Michel has been reducing it gradually and is very happy at this level. The Dosage – sugar that Drappier adds to their wines is aged in very old oak and is between 10 and 25 years old. 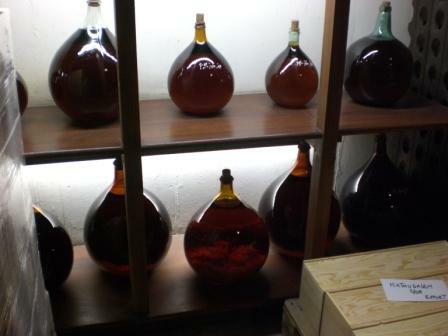 Some had been transferred to bottles – you can see in the photos of the wonderful golden colour. You can’t help but know this magical liquor although added in a very small dose has something to do with the wonderful taste of this champagne. After the cellars we went to see the disgorgement, it was very exciting, I have read about this process but never seen it. The bottles were frozen at the neck to freeze the dead yeast cells (they’ve now done their job creating the bubbles) and then when the caps were taken off and the frozen part was expelled, the wine was topped up, dosage added and then the cork. The bottles were then shaken to ensure the dosage and wine used for the topping up was well mixed. The bottles were then put back down in the cellar to age gracefully before being labelled and shipped around the world. It was now time to taste, first up – Drappier Quattuor Blanc, there’s 4000 bottles of this wine produced each year. It was first bottled in 2005 and released in 2009. Quattuor is a blend of four white wine grape varieties. Of the four, only one is familiar – Chardonnay – the other three are native varieties. The unusual thing here is that the varieties are all on the official appellation list for Champagne as being permitted, but are not used as they did not ripen well historically. The typical varieties are Chardonnay, Pinot Noir and Pinot Meunier. Michel did not have these varieties planted, but though that it would be an interesting idea to plant them and see what he could produce, he worked with the nursery at Romanee Conti and cultivated the new vines, they were planted in 2000. It’s a wonderful wine, initially it’s very clean, and then it opens up to be quite rich and round.